Visit Tanzania and take part in hiking the Kilimanjaro via the Lemosho route on this 8 Days Lemosho Route Kilimanjaro Hiking Safari. Contact us to book this safari. A guide and a mountain support crew will arrive at the hotel in the morning in order to meet you and hold pre trekking briefing, after which you will travel by vehicle (roughly 3-4 hours) to Kilimanjaro National Park’s western entrance: Londorossi Gate (2,200 m). After the quick formality of acquiring climbing permits and registering with the search and rescue service, the group will start trekking towards the first camp of the route: MtiMkubwa Camp (2,780 m). Raincoats are necessary on this day in particular, as you will be walking through rainforest. By the time you reach the camp, our professional mountain crew will prepare everything necessary, put tents and cook lunch for you. After lunch the group will depart on an acclimatization hike towards Shira 1 Camp that features a 300 meter gain in altitude, after which you will hike back down to MtiMkubwa Camp, where a hot dinner will be waiting. Note: The acclimatization hike is an easy trek with a slight gain in altitude done in order to speed up the acclimatization process. You should take the acclimatization hikes very seriously. They help increase your chances of successfully climbing Kilimanjaro and save you from the consequences of altitude sickness. An early wakeup, breakfast, and a gradual trek upwards until 3,500 meters; at that point for the first time you will be able to see stunning views of Shira Plateau and Kibo Volcano. The passage from MtiMkubwa Camp to the second high-altitude Shira 1 Camp (3,505 m) is rather easy and takes about 5-6 hours. This will allow you to start the acclimatization process gradually, which is a mainstay of good trekking. When you reach the camp, your team of specialists will cook you lunch and you will have the chance to rest in your tent or walk around the nearby area. When you arrive to camp you will have lunch, and after a two-hour rest everyone will complete an acclimatization hike towards Lava Tower Camp that features a 300 meter gain in altitude. Early wakeup, breakfast and the start of summiting Barranco Wall (we recommend you leave the camp as early as possible to avoid crowds of the other groups, After the climb you can have a rest and take photos in front of the Kibo volcano. Then you start a more difficult hike to Karanga Camp, which features numerous ascents and descents during the route, but don’t worry: our guides are experts at choosing an optimal pace for the group. After reaching the camp you will be offered Hot lunch. After a couple of hours you will have to complete an acclimatization hike in the direction of Barafu Camp with a 300-meter gain in altitude, and then descent back down to the camp. Note: The acclimatization hike is an easy trek with a slight gain in altitude done in order to speed up the acclimatization process. You should take the acclimatization hikes very seriously. Their help increase your chances of successfully summiting Kilimanjaro and save you from the consequences of altitude sickness. 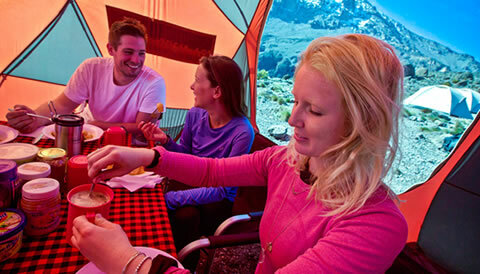 At the night you will Departure from Barafu Camp (4,640 m) and start summiting Kilimanjaro: Uhuru Peak (5,895 m). Simply the climb is relatively simple; though, the most challenging part is the high altitude where each pair of climbers will get a personal guide for the entire ascent to monitor your physical and mental conditions. After your successful ascent to Uhuru Peak, you can descend to the nearest glacier if you wish. Then you will return to Barafu Camp and after a 2-hour rest continue your descent to Millennium Camp (3,820 m). When you wake up at the camp you will feel relief from the reduction of the height and the satisfaction of reaching the summit. After a breakfast, you will start descending to the park’s exit: Mweka gate (1,650 m). Here the whole group will gather to congratulate you, followed by offering you a chance to share your opinions on the climb in the guestbook. Lastly, you will be presented with your commemorative certificates in our office and provide you a transfer back to the hotel. End of the 8 Days Lemosho Route Kilimanjaro Hiking Safari.